This case has been specially designed for the ArduPilot Mega 2.5 and all of its components, you don't need to worry about damage caused by turbulence or accidents! The ArduPilot Mega 2.5 case comes in either top open or side opening to allow you to connect your electronics, the case is also see through so you can still see all the lights on the board. 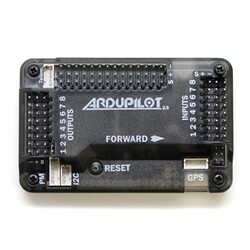 This protective case will only work with the ArduPilot Mega 2.5 The APM is not included with this case.